Indie music at it's best. "If you like mainstream rock this is a must buy for your CD collection. 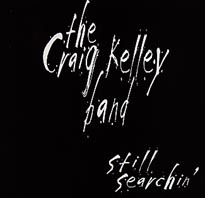 'Still Searchin' is packed with 10 of Craig Kelley's finest." "Classics in the making! These songs are truly timeless..."
I can't believe this band is an Independent artist! I am so glad that I found this CD. I've been listening to it non-stop. It is so nice to find such great music. Good luck guys!